Amazon Set To Build A Second HQ And Cities Say 'Pick Me!' : The Two-Way The announcement set off a hot municipal contest — and one big thought experiment. Mayors across North America said their cities would be the perfect home for 50,000 jobs and a $5 billion investment. Amazon said Thursday that it will spend $5 billion to build another headquarters in North America to house 50,000 new employees. 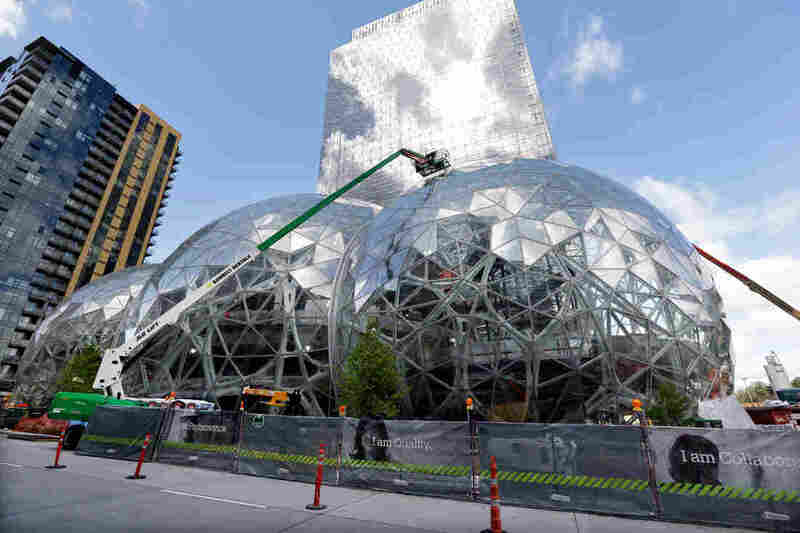 In April, workers constructed three glass-covered domes in an expansion of the company's downtown Seattle campus. Amazon made the sort of announcement Thursday morning that mayors dream about. The tech juggernaut said it was looking for the right city in which to build its "HQ2": a second headquarters in North America, equal to its campus in Seattle. And it's going to make that selection process a public one, akin to how cities bid to host an Olympic Games. "We expect to invest over $5 billion in construction and grow this second headquarters to include as many as 50,000 high-paying jobs," Amazon wrote on its website. "In addition to Amazon's direct hiring and investment, construction and ongoing operation of Amazon HQ2 is expected to create tens of thousands of additional jobs and tens of billions of dollars in additional investment in the surrounding community." Amazon, which is among NPR's financial supporters, says it is looking for a metro area of more than 1 million people, a "stable and business-friendly environment," and the potential to "attract and retain strong technical talent." The company estimates it added $38 billion to Seattle's economy between 2010 and 2016. And in its request for proposals from cities, Amazon says the average annual total compensation of those 50,000 new employeees will exceed $100,000. But Amazon's presence — and the high-paid workers it employs — has also been a major factor in creating a housing crisis in Seattle, which has the fastest-growing home prices in the country. The housing market there has become so expensive that even wealthy foreign buyers are getting priced out. Dallas: "We will aggressively demonstrate that Dallas and our surrounding area would be the perfect spot for their expansive business needs," Mayor Mike Rawlings said in a statement to CNN Tech. "Amazon already has an extensive amount of business here. They've been good corporate citizens and we look forward to future conversations." Chicago: "Chicago's unmatched workforce, world-class universities and unparalleled access to destinations throughout the world make it the perfect headquarters location for companies large and small," mayoral spokesman Grant Klinzman told the Chicago Sun-Times. "That's also why Chicago has led the nation in corporate relocations for the last four years." Toronto: "I firmly believe that Toronto is a prime candidate to host Amazon's second headquarters in North America," Mayor John Tory told the CBC. "City staff are working with Toronto Global to make sure we put together an attractive bid for this opportunity. ... I will be leading the charge to make the case that Amazon should call Toronto home." Philadelphia: "We think Philadelphia would be a PRIME location for Amazon that would make people SMILE!" tweeted mayor Jim Kenney. "Look forward to submitting a proposal!" Washington, D.C.: "Mayor Bowser has directed us to pursue every opportunity to expand employment in the District, and we have already reviewed Amazon's search for a second headquarters," a spokesperson for D.C.'s deputy mayor for planning and economic development told the Washington Business Journal. "[The] District is open for business and provides the amenities and talented workforce to be a competitive location for major tech firms." Baltimore: "Dear @amazon, please come to Baltimore City," City Councilman Eric Costello tweeted. "We've already successfully worked together, we can and we will do it again!" Pittsburgh: "With an unmatched portfolio of technological talent and intriguing development parcels, Pittsburgh is uniquely positioned to submit a winning bid for Amazon's facility," Mayor William Peduto said in a statement to CNN. "This is a transformational opportunity unlike any that we've ever seen." Similar high jinks are almost guaranteed in the pursuit of Amazon. Many cities will very likely put together proposals with big tax breaks, too — even though the company really doesn't need the money. Amazon says it is looking for communities "that think big and creatively when considering locations and real estate options." The ideas are coming fast and furious, and not just from mayors. How about putting Amazon in Chicago's Old Post Office? Or how about next to the train stations in Uptown Philadelphia? What if Amazon put its HQ in Detroit? In cities across the country, people will look around and think about where they would put 50,000 tech workers, whether in enormous old buildings or brand-new construction. With its announcement Thursday, Amazon set off a crazy corporate-Olympics contest — and one big thought experiment on the future of some American cities.